Our Directory features company profiles and case studies for organisations offering graduate and apprenticeship opportunities. The Directory showcases the top employers in our industry and is an excellent platform to promote your organisation to a huge audience school leavers, university students and graduates. The directory is a great way to reach an audience of the brightest and best students of maths, actuarial science, economics, science and statistics. Every year the Directory is distributed at over 100 UK and international careers events and through our global network of career ambassadors, teachers, university lecturers. The Directory is hosted on IFoA webpages which achieve over 150,000 views annually and has been downloaded over 9,250 times in the last year. 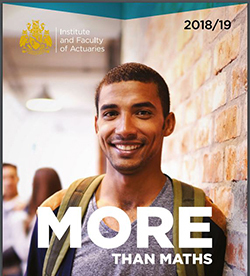 If you would like to take advantage of this opportunity to promote a career in your organisation to actuaries of the future please contact sarah.holman@actuaries.org.uk.